Oftentimes when it comes to investing, there are habits/tasks we know we should do, and habits/tasks that we’d maybe prefer to do. Saving 20% of every paycheck and keeping cool during volatile markets are examples of things we should do. Splurging on a trip to Europe and selling stocks to “wait out” the downside volatility might be examples of things we’d prefer to do. For many savers and investors, there is a constant tension between these two, even though we know that the clearest path to long-term success is saving more, spending less, and investing prudently. Much like losing weight, the formula for success is fundamentally simple – but the execution and follow-through can be painstakingly hard. The fundamental question, then, is: what can we do to shift our behavior? What can we do to form better, lasting habits that lead to long-term financial success? #1) Simple Planning – setting multiple goals with complex or extensive task lists can become overwhelming fast. At the same time, setting goals that are too abstract can open the door to writing them off. Make goals that are specific, measurable, and achievable. For example, instead of trying to start a college savings plan, a Roth IRA, and eliminating credit card debt at the same time, maybe just start with the credit card debt as the goal in focus – then move on to the others. Or, instead of establishing a goal to “save more and spend less,” maybe put a firm figure on what you want to do – budget $100 a week for food and save $250 this month. Small tangible goals such as investing $300 – 500 more toward your retirement each month this quarter are more easily achievable and are more likely to become long-term habits that will positively impact your financial plan. #2) Build an Accountability Network – research from the University of Pittsburgh School of Medicine and the University of Minnesota School of Public Health finds that human-to-human connection can help improve behavioral outcomes.¹ In layman’s terms, if you share your goals with friends and family and establish a support system, research suggests that you have a better shot at following-through. 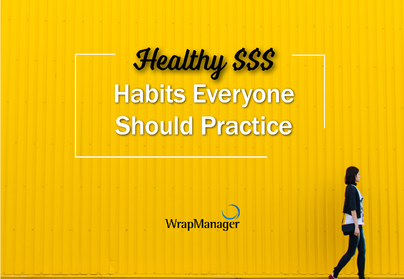 That’s one of the reasons that the wealth managers at WrapManager ask so many questions about your specific financial goals, both short and long-term. Knowing that you want to save $50,000 for each of your children’s weddings in 15 years, or that you plan on selling your home after retirement and purchasing property in Mexico to live at half-time, means that your financial advisor is able to incorporate those goals into your specific, unique investment plan. #3) A Little Humorous, Humbling Self-Deprecation Never Hurts – we’ll just come out and say it: failure to follow-through is almost always a product of our own weakness. Humans are imperfect animals, with wide-ranging emotions that lead us to get in our own way. This is especially true with investing – even though most saving and investing people have long time horizons, we still get caught up in ‘gut’ responses to short-term volatility and price movements in the market. Emotional investment decisions sometimes follow, even though history and mounds of research show that deviating from a long-term plan can adversely impact returns. We hedge anyway. Next time, it may be worthwhile to look inward, strive to identify emotional reactions to investing, and separate fear vs. reality. It’s always a good idea to take the time to speak with your financial advisor about your fears, or about your historical reactions to market volatility, so that they can incorporate appropriate tactics to counter market drops into your investment plan. #4) Establish a Relationship with an Advisor Who Can Monitor Your Financial Goal Progress – the accountability network described in point #2 is good for feeling accomplished and staying on track. A financial advisor can build on this to help you convert your good habits into quantifiable results and checkpoints on your road to retirement and wealth building. It’s one thing to become a good saver and an astute investor – it’s another to take that hard work and turn it into an investment plan designed for your financial goals and your life. A financial advisor can help with both and can help provide a third-party perspective to your plan. The Wealth Managers at WrapManager are here to support you at every step of the way, and to help you get and keep your financial life in order. We work with our clients to establish investment plans and monitor progress toward your goals. Get started with us today by calling 1-800-541-7774 or start a conversation over email at wealth@wrapmanager.com.